In a plastic bag, combine the ground mustard, Worcestershire sauce, water, soy sauce and oil; remove 1/3 cup and set aside. Cut chicken into 1 1/2 inch pieces; add to bag. Seal and refrigerate for 1 1/2 to 2 hours. Drain, discarding marinade. 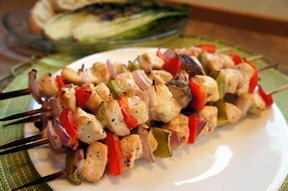 Thread chicken with vegetables alternately on skewers. Baste with reserved marinade. Grill over hot coals for 10 minutes. Turn and baste. Cook 10 minutes more or until chicken is done. 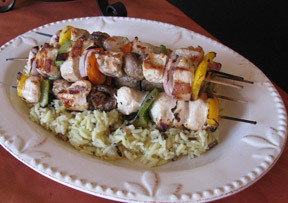 "When I was a kid my dad would make shish kabobs over a charcoal grill. 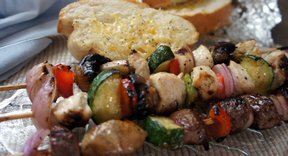 I made these on my gas grill and they really were good, but I'm sure they would be even better over that charcoal!"